The wood gasification plant WP2 generates heat and electricity from dry, pollution-free standard chopped material. Since the degree of drying of the fuel is very important for the optimum functioning of the system, a compact fuel dryer using the waste heat of the room air is an integral part of the standard equipment for the 150 KW version. After the dryer, the wood chips are transported to the fuel sluice by a screw conveyor. Because the lock was initially a frequent source of errors, a sophisticated system was developed. The downdraft fixed bed gasifier with its movable air nozzles is a patented development of the house and is with the specially adapted tissue filter the heart of the system. 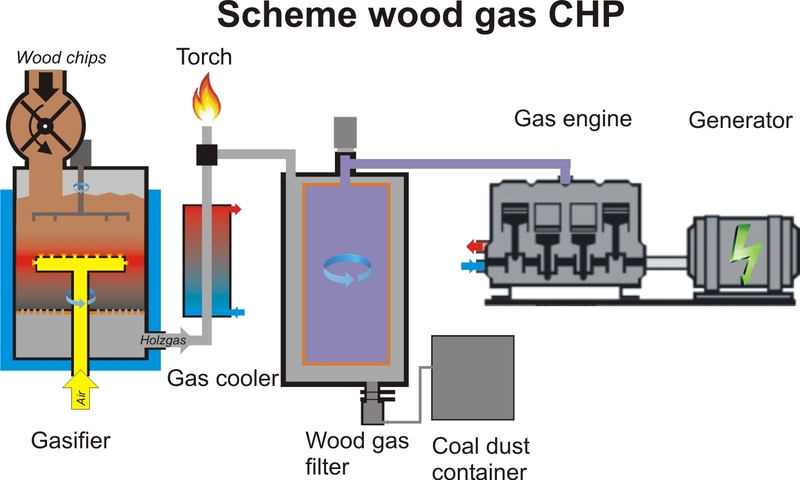 The residual ash and wood charcoal dust generated during the gasification process are carried through the gas cooler up to the wood gas filter in the stream of wood gas, thus ensuring a self-cleaning of the pipes in this area. By means of a sluice below the filter, the residual substances are transported pneumatically via a flexible hose into the carbon dust container, for which we can offer a free disposal. 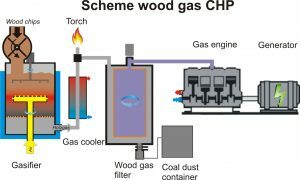 The purified wood gas leaves the filter on the upper side and is directed straight to the CHP, which essentially consists of a high-quality gas engine and a directly flanged synchronous generator. Also with the gas engine some modifications were necessary, in order to burn the wood gas optimally and efficiently. With the synchronous generator, the movement energy of the gas motor is ultimately converted into electrical current. The complete control of the system from the chip storage to the heat decoupling and current output is carried out via a modern PLC. Operation / monitoring of the system can be done local or via smartphone / PC over the internet worldwide. Gasification plant and CHP are supplied ready for operation on a basic frame, which minimizes assembly and commissioning time.